Incident Summary | A fast-moving wildfire sparked by an unknown cause is burning up everything in its path about 2 miles North of Summer Lake, between Milepost 64 and 71 on Hwy 31. It is also located about 100 miles SE of Bend, Oregon. 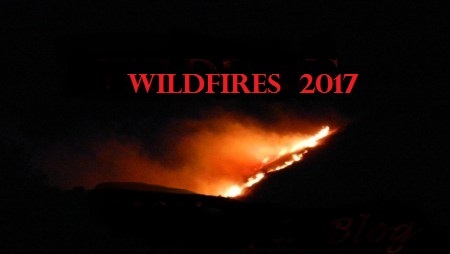 The fire is burning on private land and on the Fremont-Winema NF, BLM Lakeview District, OR Department of Fish & Wildlife and in the Summer Wildlife area lands. Size | 6,000 acres with a 5% containment status. Current Conditions | Active fire behavior with wind driven runs and uphill runs. Command | Type 2 IMT. Resources | 353 personnel broken down as 1 crew, 12 engines and 3 helicopters. Closures | Popular Hwy 31 (Route from Bend, OR to Las Vegas, NV) is closed until further notice. Damage Assessment | There were 3 structures (1 barn, 1 outbuilding, 1 hunting cabin) last night. Structure protection is still in place for the Summer Lake Lodge area. ← #BrooklynFire | Arizona | Newly Reported!